In the meantime a diamond iPad popped up. But that is something we’ll talk about a bit later. Now, let’s first see how the iPad pre-orders are doing. Putting the Apple logo on anything is a surefire way of making it sell like peanuts. No matter what people say or think of the giant iPod touch, called iPad, facts speak for themselves: everybody loves the iPad. Or at least 120 000 people thought so and pre-ordered it before even seeing it live. As you know, the iPad went on pre-order in the USA last Friday, 12 March, and three weeks later, on 3 April, it will start shipping. The initial euphoria managed to increase the pre-orders-per-hour to 25 000 so that the number of pre-ordered iPads reached 51 000 in the first two hours. By the end of the day a total of about 120 000 pre-orders have been received (not counting the number of reserved but not ordered iPads). Two of every three customers went for the Wi-Fi-only version of the device while only around 30% of the people decided to get the iPad featuring both 3G and Wi-Fi support (which will become available by the end of April). And when it comes to the onboard memory, the 16GB, 32GB and 64GB models turned out equally attractive. Before I let you share your thoughts about the iPad and its incredible first-day pre-orders, it’s time for the diamond iPad I told you a second ago. It’s exactly as tacky as it sounds. The whole device is covered by a huge number of small diamonds (11.43 carats in total) graded G/H in color and VS2/SI1 in clarity. 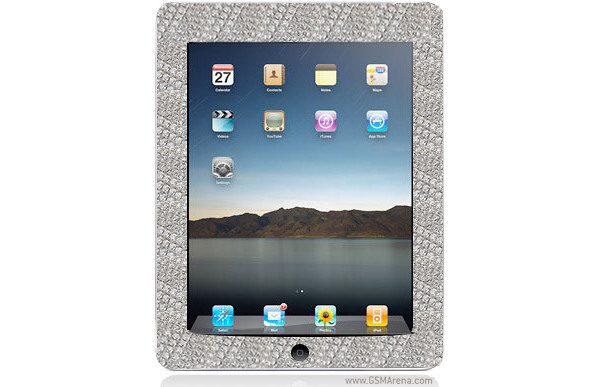 The diamond iPad will start selling on 1 June for good 20 000 US dollars.